The 21st Ohio retires from its position in the draw between Hill Two and Hill Three. The 2nd Minnesota and 35th Ohio move to fill the gap. Gracie’s Brigade aggressively attacks Hill One. 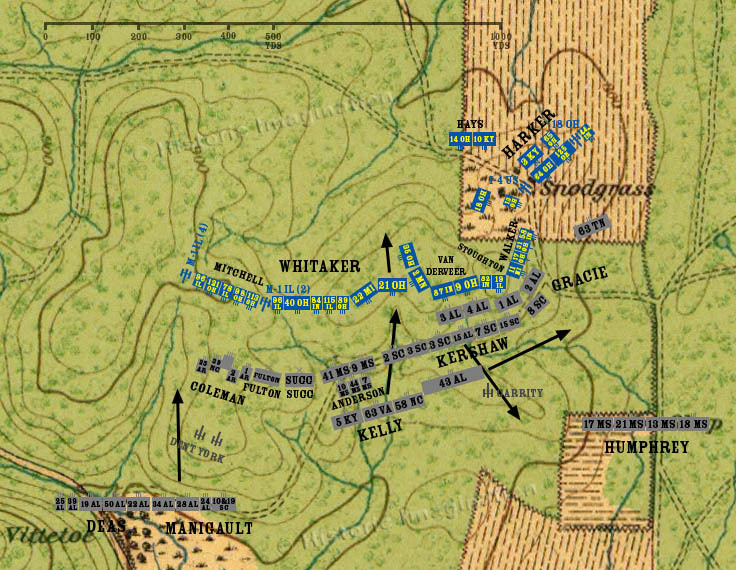 The 63rd Tennessee is devastated by Harker’s brigade in the open cornfield below the Snodgrass cabin, and Gracie orders the 43rd Alabama from the left of the brigade line to its right. Kelly’s Brigade launches its attack on Hill Two. The 15th Alabama finally withdraws from its position in Kershaw’s line and moves to rejoin the rest of Perry’s brigade near the Poe farm. Manigault orders his brigade to advance and support Johnson’s Division, but only the 34th and 28th Alabama are ready or able to comply.